Family business took us to Euroa on Saturday. The station is on the western side of the town centre. The main street goes over the railway line to the south of the station — Wikipedia notes that the the road overpass was built in 1960 during the first round of standardisation. The second round, last decade, converted the other track to standard gauge as well. North of the station the railway line is elevated… but not by much. 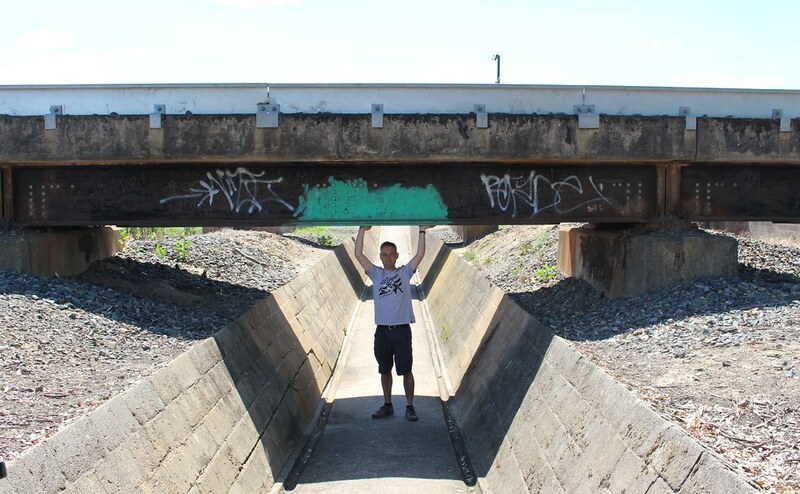 There’s also a pedestrian underpass that’s even lower – only just a bit higher than me, so about 2.0 metres. An adult wouldn’t be able to ride a bike through here. 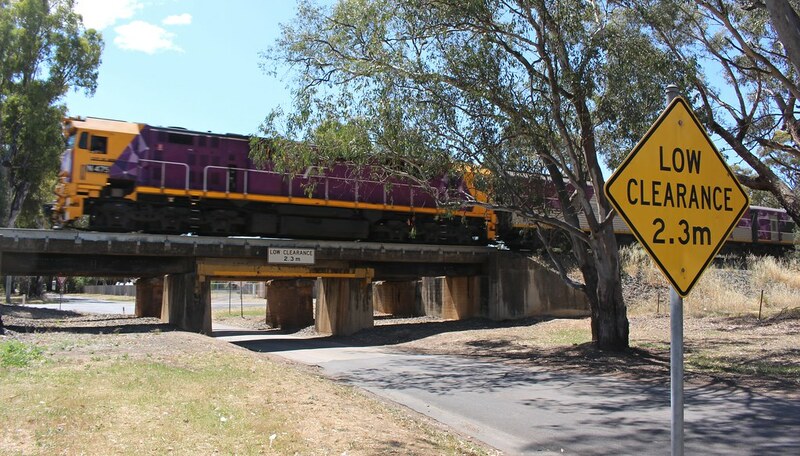 Unlike the Montague Street bridge in Melbourne (3 metres clearance), a quick search finds no records of collisions with the Euroa road bridges. I mentioned the Euroa bridge on Twitter. 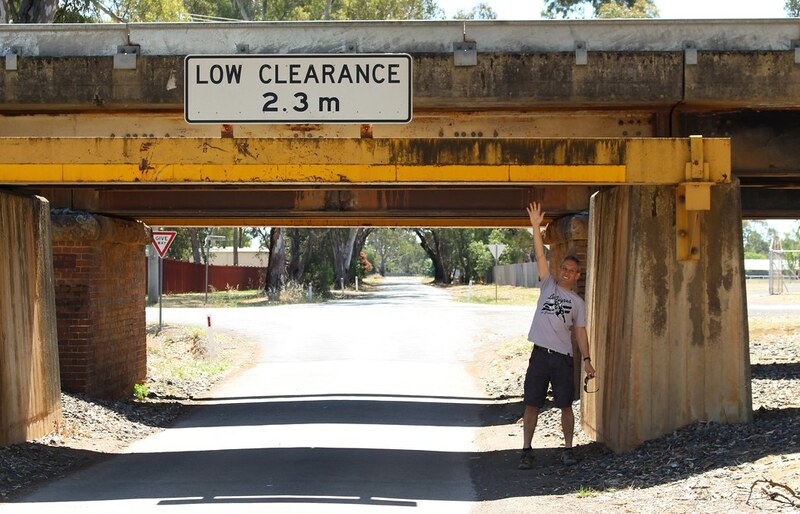 I was pointed to a 2 metre clearance on a freeway overpass in Pyrmont, Sydney, and also this 1.7 metre railway bridge in Wales — just high enough to fit a conventional car, with a manually-operated part time level crossing adjacent for taller vehicles — amazingly, not too long ago something similar was proposed for the Dandenong line! Lovely post, Daniel. Enjoyed it muchly. Maybe it’s just the angle but that 2m clearance in Pyrmont and 1.9m clearance in Wynnum looks pretty crazy in comparison to the bridge structure bulkhead which seems to be taller than the clearances themselves. The underpass is quite long (I think it used to go under a railyard) and not uniform in height, so you can start walking upright but by the middle you realise you’re screwed. The locals who used it as pedestrians were mainly women. They’ve building construction on a new railway station on the land on the land above to service the Yamanote loop line so I believe it’s going to disappear in the next couple of years. Japanese railway companies have been making an effort to remove “level crossings that never open” in the last couple of decades so I’m not surprised to see unergonomic underpasses get the flick too. @adrian: I remember one along the Yarra River on my way between Flinders Street and I think South Yarra. At least most of the mentioned instances are local streets (not sure about Tokyo’s example), and in the case of Sydney, have the next street over as an alternate route. Montague Road underpass on the other hand, I don’t think the collisions would end as long as it’s one of the main roads for access between Melbourne CBD, the West Gate Freeway, and Port Melbourne/Albert Park/St Kilda.